These fingerless mittens are quick and easy to make. 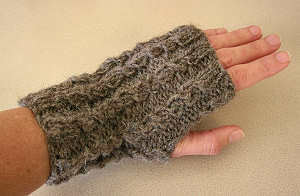 The stitch pattern was adapted from the Baby Cable Ribbing pattern in Barbara Walker’s A Treasury of Knitting Patterns . I used some of my handspun yarn but any worsted weight yarn should work. The width can be adjusted up or down by adding or subtracting cast on stitches in multiples of 4. Knit 4 rounds in K2, P2 rib. Round 4: *K 2 stitches together but do not take the stitch off of the left needle. Put the right needle between the two stitches on the left needle that you just knit together and knit the first stitch again. Take both stitches off of the left needle. P2. Repeat from * around. Repeat these 4 pattern rounds 6 times. Start thumb: On the next round, cast off 4 stitches for the thumb and continue around. On the next round, cast on 4 stitches in the same location where you cast off 4 stitches and continue the round. Finish next two rounds in pattern. Knit two more complete patterns. Knit 5 rounds of K2, P2 rib. Cast off and weave in ends. Copyright (c) 2005 Sydney Harper for Personal, Non-Commercial Use only. Not to be copied by Merchants for sale or distribution. Not to be used for garments for sale.